$4.99 Shipping Sale! PROMO CODE: TSSHIP618See Details! 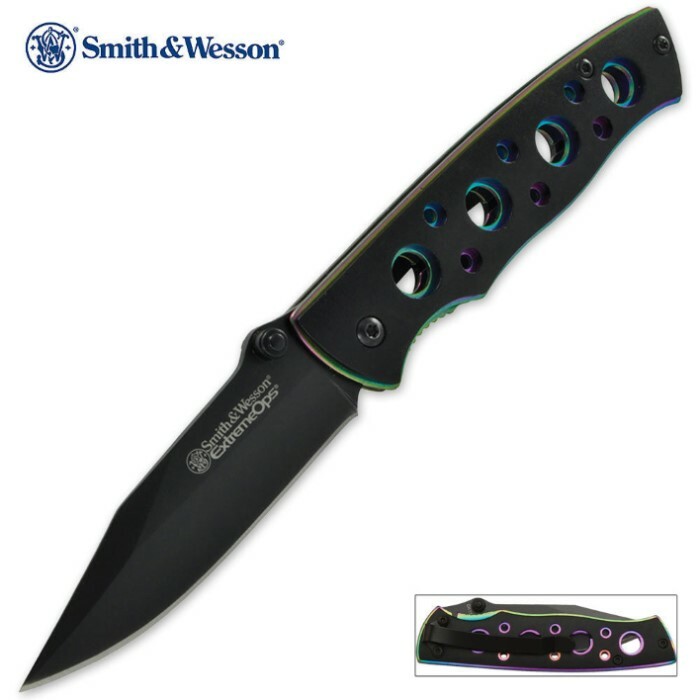 This Smith & Wesson Extreme Ops folding knife features a 2 7/10 in. teflon-coated 400 series stainless steel blade with a thumb stud for easy one-handed opening. The skeletonized aluminum handle is lightweight but tough to withstand impacts. 3 7/10 in. closed. Bought one of these just a few days before Christmas. Very impressive. A tad smaller than usual but the quality of this blade overcomes that issue quickly. Be it a smaller EDC or something nice for your collection - or just because you like it - this blade is a purchase everyone should seriously consider. This knife is great! It is a little smaller then I expected but its sharp, durable, and has no play to the blade! Get this you won't regret it!!! Incredible knife. Comes sharp, and after a little sharpening, The blade can cut like butter. Very, very easy to conceal, and the rainbow gives it a very nice design overall. I used the knife for straight throwing, and it can pierce through almost anything! Great for the price, you can't go wrong with this handy little knife. Very nice knife, is very concealable most people wont even know I have it on me. Comes pretty sharp and I love the rainbow of it, gives this knife a unique look amongst the others and definitely stands out of the crowd.